Note: these identification tips apply specifically to mature males; features may differ in immature males and females. 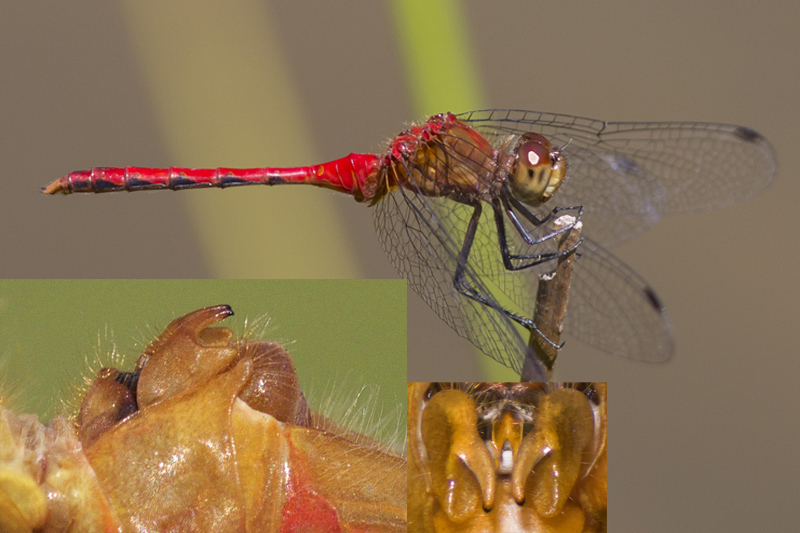 Male White-faced, Cherry-faced, and Ruby Meadowhawks cannot be identified reliably without a clear closeup photo of the hamule; see inset photo below. distribution Throughout the mountains and foothills of the Piedmont, and also present in the northern half of the Piedmont; records south to Wake, Chatham, Davie, and Rutherford counties. Apparently absent from the southeastern portion of the Piedmont and all of the Coastal Plain. abundance Fairly common, to locally common, in the mountains; uncommon in the foothills, but rare in the northern Piedmont east to Caswell and Guilford counties, and apparently very rare east to Wake County. Surprisingly there seems to be only one recent record for the Piedmont east of the foothills, suggesting a population decline there. flight Unlike most other meadowhawks, this species flies mainly in summer. The mountain flight occurs from mid-May to late September. The Piedmont flight is similar -- late May to early October. habitat Mainly breeds at temporary pools and ponds, marshes, and other small bodies of water. behavior Adults forage away from these small pools, perching on twigs and other vegetation, often fairly low. comments Considering the bright red color of the males, its habit of perching in somewhat conspicuous places, and its flight in the middle of the season when many people are out looking for odonates, the species is only infrequently reported away from the mountains, thus "corroborating" that it is definitely not a numerous dragonfly in most of the Piedmont. In fact, the great increase in the number of odonate watchers in the Piedmont strongly indicates that the species has declined east of the mountains, as Cuyler's many collections from the Piedmont have not been backed up by recent photos and observations. In this latter region, it is clearly outnumbered by Autumn and Blue-faced meadowhawks. Fortunately, it can be quite numerous in the mountains, and there are a few daily counts there of at least 30 individuals.